Winter is here and for many of us in the Northeast that means thinking about our Miatas more than driving them. So what could be better than nice stroll down memory lane with this compilation of all the articles published in Road & Track magazine about our favorite roadster. 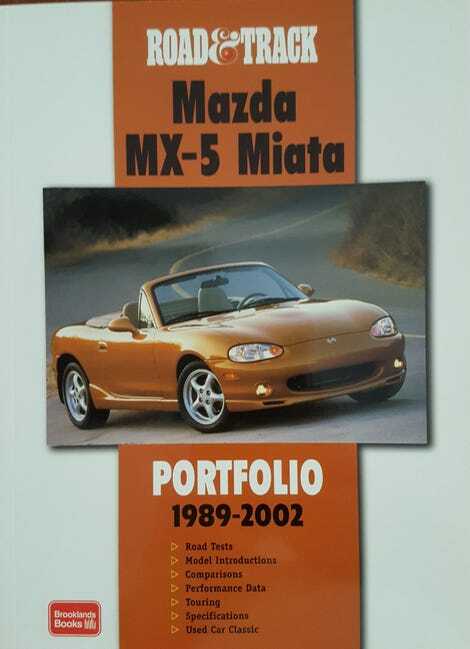 The Road & Track Mazda MX-5 Miata Portfolio 1989-2002 ($19.95 Brooklands Books, Ltd) starts with a gushing article about a pre-launch version of the the NA and ends with a, well, gushing article about the 2002 LS. But can you blame them? Admittedly, the MX-5 Portfolio is hard to sit down and read cover-to-cover. The car did not undergo many significant changes from year-to-year and so the articles can start to sound a bit repetitive until something big comes along. Stories about tuner versions and changes like the increase in engine displacement to 1.8 L or the introduction of the NB are a nice change of pace. To that end, I didn’t read the MX-5 Portfolio all at once. It is better suited to pulling off the shelf to read an article once in a while and then putting it away again. That said, the articles are fascinating for the way they put the NA and NB into the context of the times in which they were designed. Every one of them is worth reading. The most interesting, in my opinion, are the comparison test because they read like a list of foes that have been bested by the little roadster. All three of the cars to which they compared it went out of production and have no modern equivalent. Mercury Capri? Honda Civic Del Sol Si? Toyota MR2 Spyder? All gone. Mazda Miata? Stick carving up back roads in its fourth generation.